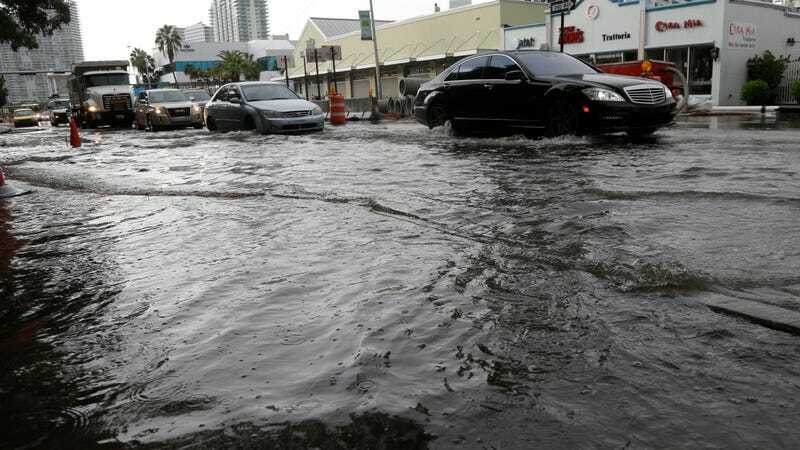 In Miami, it’s no secret that sunny day flooding is occurring more often, nor that rising sea levels and climate change are to blame. But, as is often the case when you drill down into the inner workings of our planet, the full story is a bit more complicated. Sea levels in South Florida have gone up about a foot since the 1930s, but around 2011, the slow upward creep of the ocean seemed to kick into high gear, with tidal gauges recording much faster rates of sea level rise and residents noting a stark uptick in so-called “nuisance” floods. A new study confirms that this was not Floridians’ imaginations: From 2011 to at least 2015, the rate of sea level rise across the southeastern US shot up by a factor of six, from 3-4 millimeters a year to 20, and a combination of oceanic and atmospheric processes seem to be responsible. While more research is needed to be sure of what caused this sea level “hot spot,” the study reminds us that the oceans aren’t rising evenly, in space or time. Indeed, while we tend to picture Earth’s oceans like a slowly-filling bathtub of water, a more apt analogy would be a pool peppered with giant rocks, swirling whirlpools, and bumpy air currents, all of which cause water to slosh back and forth, piling up in specific places. On average, climate change is causing sea levels to rise about 3 mm/year, but zoom in any one location, and the rate might look very different. Take South Florida, where, a few years back, the rate of sea level rise shot up from close to the global average to something much higher. 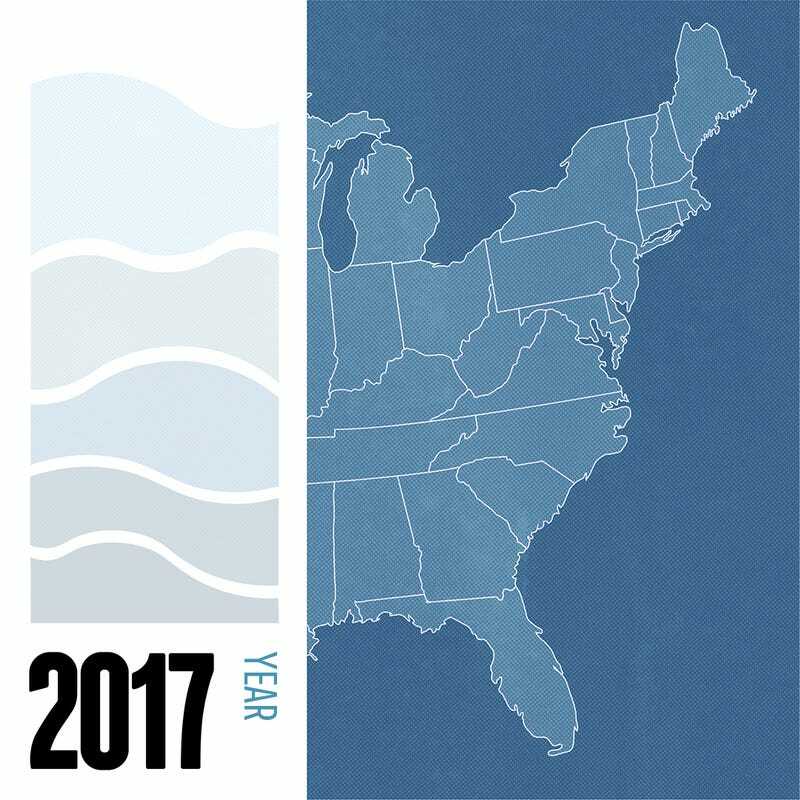 To figure out what was going on, University of Florida climate scientist Arnoldo Valle-Levinson and his colleagues analyzed sea level records along the entire East Coast for the past 95 years, pulling data from the Hawaii Sea Level Center and NOAA’s tide stations. Throughout the record, they found that a combination of two naturally-occurring climate patterns—the El Niño Southern Oscillation (ENSO) and the North Atlantic Oscillation (NAO)—were associated with “hot spots” of sea level rise along the Eastern seaboard, including the southeastern hot spot from 2011 to 2015. The ENSO, the researchers concluded, influences the timing of water pooling up along the western margin of the Atlantic, while the NAO—a measure of atmospheric pressure difference between the subtropics and Iceland—seems to impact where exactly sea level pileups occur. It’s important to note that other scientists have fingered different climactic processes driving sea level hotspots. John Fasullo, a climate scientist at the National Center for Atmospheric Research, told Gizmodo he thought the mechanism “seems plausible though perhaps incomplete,” suggesting that the Pacific Decadal Oscillation might also be playing a role. Benjamin Hamlington, a sea level expert at Old Dominion University, agreed. “There are other factors at play here that haven’t been ruled out as far as I can tell,” he told Gizmodo, also noting the possible role of the PDO, and pointing out that the underlying mechanisms aren’t entirely clear. Valle-Levinson said his team would be able to test what they were proposing once they are able to look at sediment records—which preserve information about historical sea level changes—with a resolution of less than a year. All of which is to say, sea levels are rising, but the way they are rising is messy and complicated. We’re still trying to figure out how to predict which areas will get hit the hardest, and when. Wanless says this shouldn’t obscure the bigger picture, which is that globally, Florida is in for catastrophic levels of sea level rise by the end of the century if we don’t get carbon in the atmosphere under control. Whatever caused sea level rise to spike in the southeast from 2011 to 2015, he hopes it sent a message.